I have modified my uCurrent with 3xAAA batteries, maybe I have broken it. Supply voltage is currently 4.4 V. mA and uA range is fine, but nA behaves strange: With 1 uA I can measure 1 mV in the uA range and I can verify the current with my HM8012, but in the nA range the output voltage is 40 mV and it jumps around when I touch the output, sometimes 20 mV. 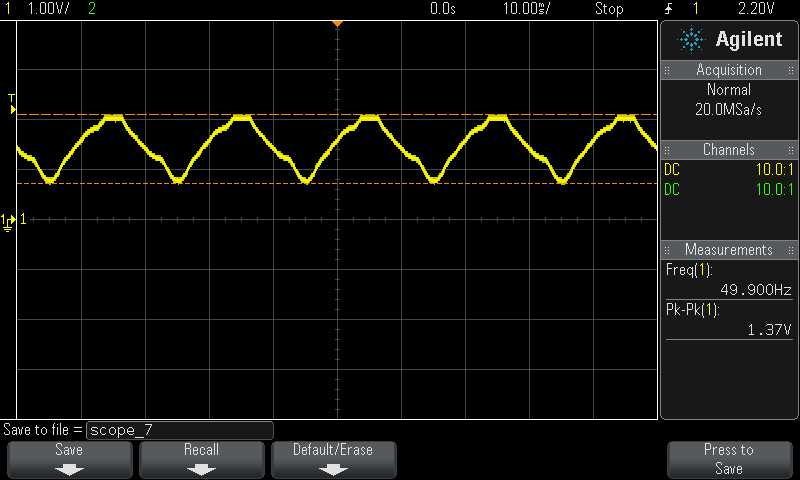 I know, I probably shouldn't do this because of ESD, but the output is stable with the other ranges. Maybe one of the OpAmps is broken and I can order it from Digikey to replace it? You might of course have broken it, but I doubt it. It's more likely that you do measure noise. 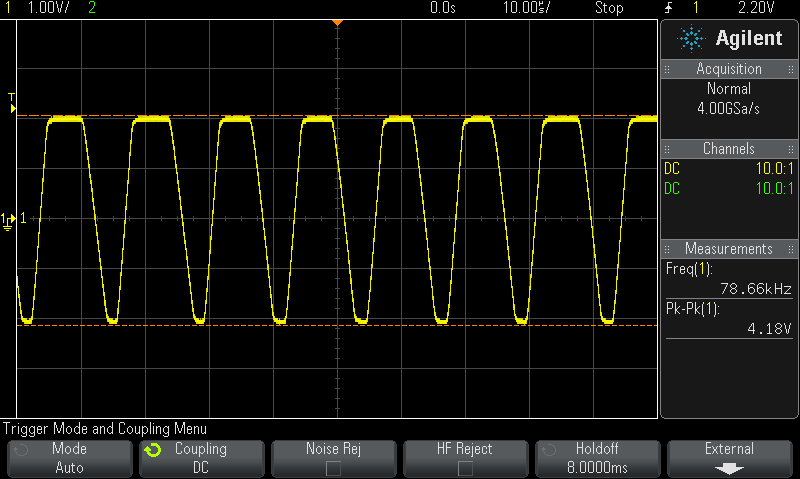 In the nA range, the uCurrent uses a 10kOhm shunt resistor which seems high enough to easily pick up RFI. Best to place the uCurrent *and* the DUT both in an shielded enclosure. RFI shouldn't be a problem. My HM8012 has a 1 k resistor for the uA range and doesn't show this problem with the same setup. But I narrowed down the problem. First I created a test setup without any power supply, to eliminate this as a possible error source, just a 1.5 V battery and a 1 meg ohm resistor. And if I don't touch anything, it shows the right value. But as soon as I touch the positive output or input it changes up to 60%. I verified it with my BM257s and it doesn't have this problem. I wonder if something is oscillating, can you put a scope on the output? Did you put a scope on the uCurrent before you changed to the AAA battery pack? In other words, was there any ringing visible on a scope when using the stock button cell battery? Also, what are the negative implications of adding that capacitor? No, I didn't measure it with a scope before. But I guess it is the same, not related to the battery. It is just too sensitive in nA range. 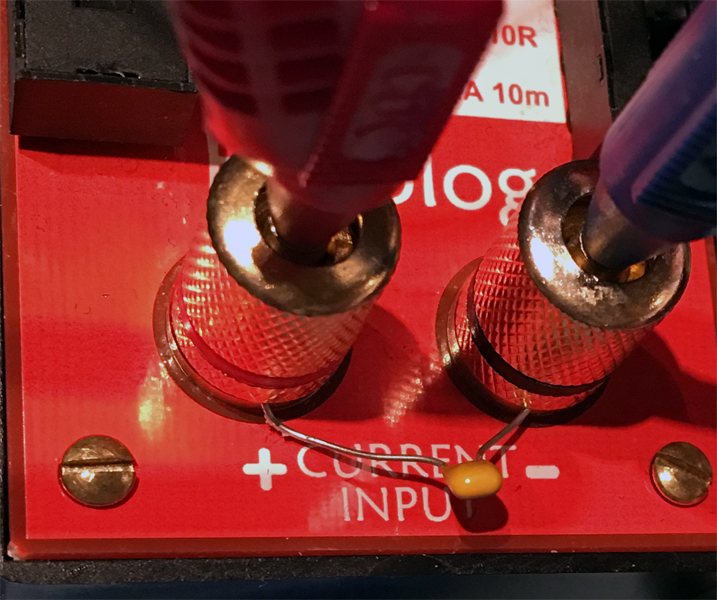 If you want to measure AC, the capacitor conducts in parallel with the internal shunt resistor (depending on the frequency), which results in an error. But I think no problem for DC, which I measure most often.